In Once a Gentleman, the final book in the Ladies’ Fashionable Cabinet trilogy, Prudence, the heroine, has occasion to deal with a modiste (ie a dressmaker or designer) called Madame Lanchester. This lady is not an invention of the author. She did exist, and was in fact a very prominent modiste in early 19th century London. Though she is said to have craved publicity, there is precious little information available about Madame Lanchester. Her designs appeared in fashion plates from many of the important ladies’ magazines of the day, including Phillips’ Fashions of London and Paris (where her designs are credited to Mrs. Lanchester of Sackville Street), Ackermann’s Repository of Arts and La Belle Assemblée, so it seemed appropriate that she would want her dresses seen in prints in the Ladies’ Fashionable Cabinet, the fictional magazine for which Prudence is the acting editor-in-chief. Ann Lanchester is thought to have been English, “Madame” being an affectation to inspire confidence in a clientele that looked to Paris for the latest fashions. She is known to have had showrooms on Sackville Street, St. James Street, and then New Bond Street. She does not appear to have been a very good businesswoman, as she declared bankruptcy in 1803 and again in 1810. She had at least one known pupil, Mrs. Osgood, who went on to make a name for herself as a fashionable modiste. 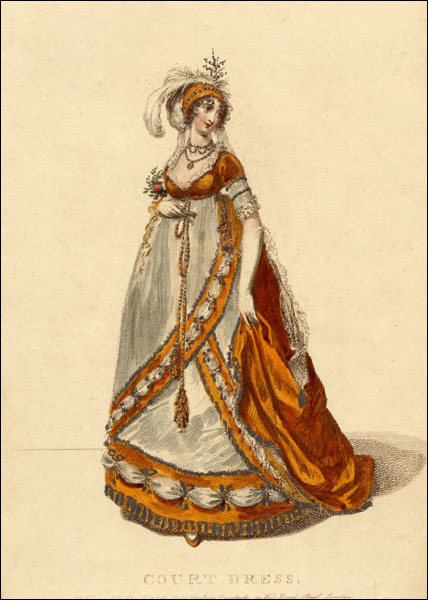 Most interesting is that for a very brief period, 1803-4, Madame Lanchester published her own fashion magazine, La Miroir de la Mode (another French affectation). There were two fashion plates in each issue, and the magazine text was in English, French, and Italian. (The lady must have had grand ambitions!) The plates from the publication are of a very high quality, beautifully engraved and painted, and often incorporating bits of gold and silver paint. They are printed on heavy paper and are full quarto size, ie much larger than most of the prints seen in the Collections on this site. Such production qualities were expensive. It can be assumed, therefore, that La Miroir de la Mode was an upscale publication targeted to the upper class, which is in keeping with the little we know about Madame Lanchester. Its short life-span is likely because it was simply too expensive to produce. Or perhaps she had a benefactor who ceased to support her. It was during the run of this magazine that she declared her first bankruptcy, so one has to wonder how she was able to finance so expensive a publication. When Ackermann’s Repository of Arts began publication in 1809, Madame Lanchester appears to have briefly played the role of fashion editor. In the inaugural issue of that publication, the descriptions of the fashion plates are followed by this note: “It is almost unnecessary to add that the design and description of the ladies’ fashions in this month are under the direction of Madame Lanchester, whose taste in the department of ladies’ dress and female ornaments is so well known as to render any eulogium unnecessary.” She must certainly have been an important figure in the world of fashion, a name familiar to the readers of the Repository. She continues to be mentioned in the next three issues as having furnished the designs for the plates “in her usual taste.” By May of that year, however, her name disappears in the commentary, but a personage called Arbiter Elegantarium offers General Observations on fashion beginning that month and continuing for several years. Could this have been Madame Lanchester? After her 1810 bankruptcy, Mrs. Ann Lanchester disappears from the records. Despite the scarcity of information on Madame Lanchester, or perhaps because of it, I thought it would be fun to give her a role to play in Once a Gentleman. The fashion editor of the Ladies’ Fashionable Cabinet, the ever-stylish Flora Gallagher, would certainly have patronized such a well-known and fashionable modiste. And who better to enlist in the transformation of Prudence from a Plain Jane into a striking beauty? Besides the print shown here from her own publication, which is heavily embellished with silver metallic paint, you can see more of Madame Lanchester’s designs in this article on Walking Dresses from the August 1800 issue of Fashions of London and Paris, and this article on an Opera Dress from the March 1809 issue of Ackermann’s Repository of Arts.